Testing and monitoring are normal parts of care during pregnancy. But some pregnancies may require extra testing to check the health of the baby more closely. In most cases the results of monitoring will reassure you and your doctor that all is going well with your pregnancy. If your doctor has recommended you to complete NST and AFI testing then don’t be alarmed. The tests are simple, comfortable, non-invasive and safe. It takes approximately 30 mins – 1 hr. to complete both tests. Most women enjoy these tests because they provide reassurance about the health of their baby, and also because they get to hear the baby’s heartbeat. Why is this special fetal testing needed? The Fetal Non-Stress test is a simple, non-invasive test performed in pregnancies over 28 weeks of gestation. This common prenatal test is named “non-stress” because no stress is placed on the fetus during the test. 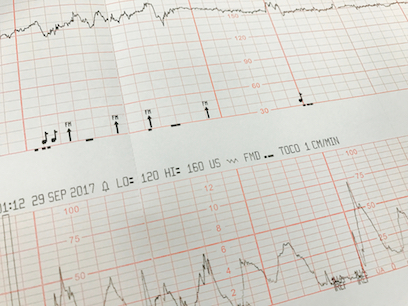 The primary goal is to observe the heart rate of the fetus through a longer period of time, and this test is a good indication of whether the baby is receiving enough oxygen. During the test, 2 belts are placed on the mother’s abdomen; one to measure fetal heart rate and the other to measure contractions. This test can be completed in our office and also at the hospital. The test is performed for 20-40 minutes (so make sure to bring a good book). If your baby does not move for a while during the Non-Stress test, he or she may just be asleep. Your nurse may suggest you have something to drink to make the baby active. A buzzer sound device may also be used to wake the baby and cause movement to make sure it is doing well. NST is usually performed twice a week until the baby is born. 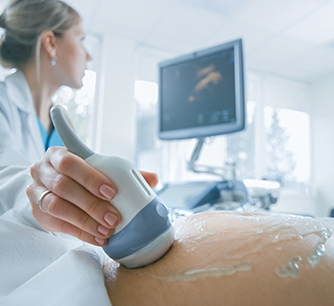 In addition to the Non-Stress Test (NST), the doctor may order an ultrasound to measure the Amniotic Fluid Index (AFI) level. Amniotic fluid surrounds your baby in your womb. It cushions your baby, helps the development of your baby’s lungs, digestive system, and muscle development, and helps protect the umbilical cord from too much compression. The ultrasound technician will have you lie down on your back and will move the ultrasound transducer over your abdomen. You’ll be able to see your baby on the monitor while the tech carefully measures the pockets of fluid surrounding your baby. The measurements are added up to give your baby a score called AFI. AFI is performed once a week until the baby is born.